Cait Gordon read 28 books of her goal of 15! 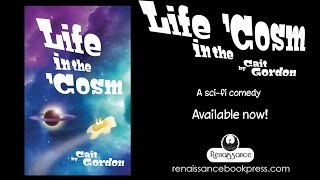 Cait Gordon is the author of Life in the ’Cosm (Renaissance), which is about a little green guy who’s on an adventure to save half the person he loves. The Stealth Lovers—the origin tale of legendary warriors Xax Knightly and Viv Tirowen—will be published in the fall of 2019! Her short story, A Night at the Rabbit Hole, appears in the Alice Unbound Beyond Wonderland anthology (Colleen Anderson, Exile Editions). Another short story, The Hilltop Gathering, will be included in the We Shall Be Monsters anthology (Derek Newman-Stille, Renaissance) in late December 2018. When she’s not writing, she’s editing manuscripts for indie authors and running The Spoonie Authors Network, a blog whose contributors are writers who manage disabilities and/or ch Cait Gordon is the author of Life in the ’Cosm (Renaissance), which is about a little green guy who’s on an adventure to save half the person he loves. The Stealth Lovers—the origin tale of legendary warriors Xax Knightly and Viv Tirowen—will be published in the fall of 2019! When she’s not writing, she’s editing manuscripts for indie authors and running The Spoonie Authors Network, a blog whose contributors are writers who manage disabilities and/or chronic conditions. She's recently joined up with sensitivity editor Talia C. Johnson to co-edit the Nothing Without Us Anthology. To ask Cait Gordon questions, please sign up. Cait Gordon The mystery of: WHERE THE HECK DID I PUT THE THING? IT WAS HERE A MINUTE AGO! (I have brain fog because of fibromyalgia and it's amazing if I can find…moreThe mystery of: WHERE THE HECK DID I PUT THE THING? IT WAS HERE A MINUTE AGO! We’d love your help. Let us know what’s wrong with this preview of Over the Rainbow by Derek Newman-Stille. Full disclosure: I'm one of the editors of this book. But who cares? I'm also a huge fan. This is the second work I've read from this author, and I really love her world building. She also crafts characters that draw me right in. It was so hard to ed Full disclosure: I'm one of the editors of this book. This is the second work I've read from this author, and I really love her world building. She also crafts characters that draw me right in. It was so hard to edit the story because I wanted to read through to the end without stopping. I really admire how there are so many elements of the fantasy genre in it—like demons, zombies, telepaths, magic, and of course an adorable dragon—and it never feels tropey. Everything fits together in this richly developed tale. It’s Canada, in the future. We made alien contact years ago, and they kicked the snot out of us. We call them the Daemons. They conquered much of our land and live in their territory. We do, too, but our land might be full of diseased humans who come out at night and want to kill us. Enter a third enemy, another alien force that’s capturing our people stationed in space and literally stripping them to the bone. Worse yet, these bad aliens are getting closer to Earth. Okay, this is not good. Might be a time to join forces with the Daemons. They don’t want to eat us, at least, and seem to be warriors with beyotchin’ skills.